See you at the Coffee Bean and Tea Leaf, Robinsons Galleria, 2PM. I'm happy to note that in the July issue of Locus, critic and editor Rich Horton gave both "Philippine Speculative Fiction IV" and "A Time for Dragons" thumbs up. This is fantastic news and a tremendous boost to the local spec fic community, as multiple authors from both anthos were cited. Congratulations to all the contributors (remember that the strength of an antho is derived from the quality of the stories therein)! It's encouraging to know that stories we write are competitive in terms of theme, quality, writing and imagination with what our comrades-in-letters outside the Philippines produce. And I'm doubly proud of Vin Simbulan's editorial debut! If you're abroad and want a copy of either or both books, email me and we'll work something out. Thanks to Rich for his kind words and to Charles for getting the word out. Oh, there's also a Publishers Weekly review of "The Apex Book of World SF", edited by Lavie Tidhar, where a story of mine appears in. Here's the TOC for "The Farthest Shore", the secondary world-themed digital anthology that Joseph Nacino and I are editing. Thanks to everyone who submitted a story for consideration. As co-editors, we're also contributing a story each (mine is a "Forlorn" story). This should be available late August. Yes, it's a happy day! I don't know how many US readers and writers are aware of it, but there is a vital and growing SF/F community in the Philippines these days. 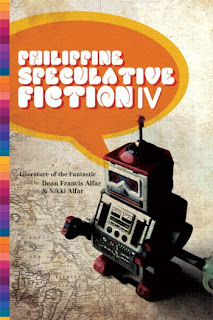 Good evidence exists for it in this latest volume of the anthology, Philippine Speculative Fiction IV. This volume is edited by Dean Francis Alfar and Nikki Alfar, two of this scene's best writers. I've been lucky enough to have acquired the previous three volumes in this series and have been impressed with the quality of the fiction and the scope of it -- quiet, personal stories of the fantastic, real science fiction, tales based on traditional Philippine folklore and mythology, structurally experimental pieces, and humorous commentaries on life in the 21st century. One of the benefits of this literary culture for world wide readers of English has been the online presence of Charles Tan, whose Bibliophile Stalker site http://charles-tan.blogspot.com/ is among the best at presenting current news, interviews and reviews of English language speculative fiction. One need not delve too deeply into this Philippine literary phenomenon to quickly realize that there is a treasure trove of talent there. Volume 4 of the series is, in my humble opinion, the best yet in the series. It contains 24 stories by both new and more established writers. I'll just mention some of my favorites, although there were few pieces in the anthology that did not excite me, move me, or make me think. The Secret Origin of Spin-Man by Andrew Drilon -- Drilon is not only a fiction writer but a well known comics creator. I've read his fiction before and was struck by the inherent energy and willingness to take chances. This particular story, though, surprised me in that it was a more traditionally written and structured piece with a much more personal story about comics and brothers and where we find ourselves after the years have passed. Beautifuuly written with real emotional impact. Revenge of the Tiktaks by Noel Tio -- From what I read in the notes to the story, I discovered that this is Tio's first published story. He's off to a great start. It starts with boys in seminary sleeping quarters hearing a strange sound in the middle of the night and escalates into a full blown poltergeist visitation. There is something about the authenticity of the setting and characters here that make the haunting effective. Breathing Space by Maryanne Moll -- This one's a real gem. I loved the precision in the writing here and the minimalist approach. No excess baggage and yet the story comes across as very powerful. A story about a woman betrayed by her man and a decision to be made. And there's more! Head on over here. Thanks, Jeff! We are all inspired to write more.